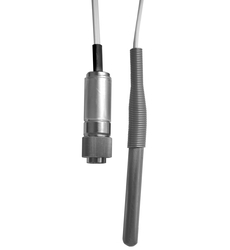 The PB-7006-1M5 is a general purpose stainless steel probe with a 1.5m flat cable designed to pass through a fridge or freezer door seal with minimal effect. It monitors temperatures as low as -80°C and as high as +250°C* making it ideal for a variety of applications from cold stores to incubators. This waterproof (IP67) probe uses a high specification resin and a unique manufacturing technique that allows both the sheath and the cables to be exposed to their full temperature range. This probe is also available with a 3m cable (PB-7006-3M).